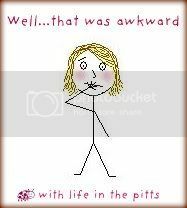 Life in the Pitts: Would you like to hear an awkward story? Would you like to hear an awkward story? Hey guys, I'm thinking about doing a linky party this Thursday. I have a VERY awkward story to share, and I was hoping you guys would have awkward stories for me to read, too. And we could all share in our embarrassment. I would give you a badge. This one. And then you could put that somewhere on your post, so other people can find the awkward party. If you want to. You could also link up, and not use the badge. It's not going to be one of those hard-core full-of-rules parties (like this one I once did). So, what do you think? Do you want to read my story? Would you participate in the party? 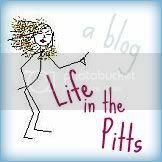 You could link a new post (that awkward story you've been thinking about writing, but were a little nervous about), or link up to an old cringe-worthy post. One like this, or like this. Or, gosh, like this. Please comment and tell me if you would participate. I usually don't mind playing to what feels like an empty house, but if I'm going to do this post justice, I need some encouragement. See, I would have to draw stick figures. And it's been about 2 years since I've done that. It's daunting. Well, THAT was awkward. A link up. Calm down. She would be a cute boy. "Anything that smells better than my armpits."